I used to work on projects one at a time and stay with each until I finished, but lately I have a lot of them going on and work on whatever suits my fancy at the moment. I'd been wanting to make a Tiramisu baby blanket and got one started recently. It's going quickly and I have the stitch pattern memorized, so hopefully it'll be finished soon! 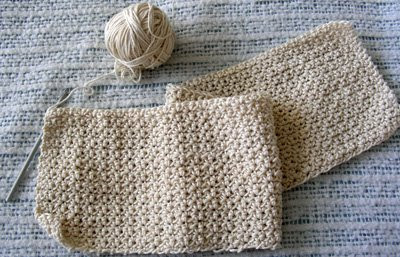 i would so love to have the pattern for this baby blanket~!~ it's just beautiful and simple and elegant~!~perfection~! !~and although i can't knit, i can crochet~!~can you share where you got the pattern? Hi! I was wondering if you used the I hook suggested in the pattern or if you used a smaller hook. Your picture looks like it has a tighter weave than the one pictured in the pattern page. Thanks! I used Sugar Babies cotton yarn and a size 8 crochet hook (a teensy bit larger than what the yarn called for but it gave it a nice drape.) It went quickly and it's an easy pattern. I think you'd enjoy it!